10:15 a.m.—Resistance Welding of Aluminum, Ray Michelena and Jeff Morgan, TJ Snow Co.
11:15 a.m.—Arc Welding of Aluminum, Frank Armao, director of aluminum technology, The Lincoln Electric Co.
12:00 p.m.—Sensing Challenges When Stamping and Welding Nonferrous Materials (Aluminum): Electronic Tricks of the Trade, David Bird, key account manager, and Shawn Day, product marketing manager, Balluff, Inc.
Meet in Cleveland in August and learn the latest techniques for cutting, forming and joining aluminum. Aluminum increasingly is becoming the material of choice in the auto industry and beyond. Join PMA and MetalForming magazine on August 30 in Cleveland, OH, for a day of presentations focused on achieving success in cutting, forming and joining aluminum. 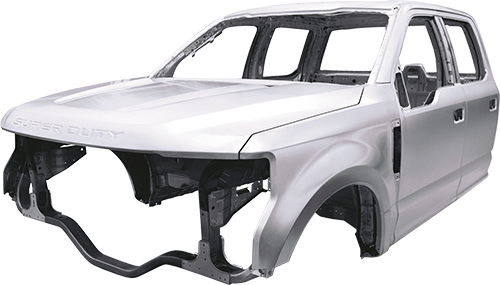 The stats are there: Ducker Worldwide forecasts that by 2025 aluminum will comprise more than 75 percent of pickup-truck body parts, 24 percent of large sedans, 22 percent of SUVs and 18 percent of minivan-body and closure parts. And, as we all know, aluminum penetrates the full spectrum of markets. But, aluminum presents a unique set of challenges: It has high reflectivity and thermal conductivity; a low melting point and stubborn oxide layer; and can be difficult to cut, form and weld. To overcome these challenges, Alumitech 2017 offers a full day of presentations to help metalformers and fabricators discover best practices needed to successfully cut, form and weld aluminum sheet and plate. Join us for talks on lubrication, tooling specification, welding procedures and techniques and much more. Our experienced speakers are on the leading edge of aluminum technology. They represent every department, from executive leadership and sales to marketing and R&D. Attend Alumitech for only $199 for PMA members and $399 for nonmembers. Out-of-town attendees are encouraged to take advantage of a special PMA guest rate at the Holiday Inn Cleveland-South Independence, including complimentary shuttle to and from Cleveland Hopkins International Airport and to and from PMA for the program. See also: Almetals, Inc., T. J. Snow Company, Lincoln Electric Co., Balluff, Inc., Coe Press Equipment Corporation, Tower Metalworking Fluids, Engineering Quality Solutions, Inc.